If you're driving on Route 340 not far from Waynesboro, Virginia, you'll hit a pleasant little town with the dark and gloomy name of Dooms. That alone would be reason enough for an eccentric roadside attraction fan to get off Interstate 81 in western Virginia, but wait, there's so much more! On the corner of Route 340 and Purple Cow Road is, well, a purple cow. 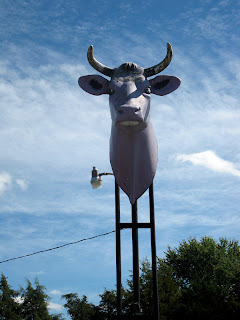 Actually, it's the fiberglass head of a purple cow attached to a pole that the locals have been using as a landmark for nearly fifty years. 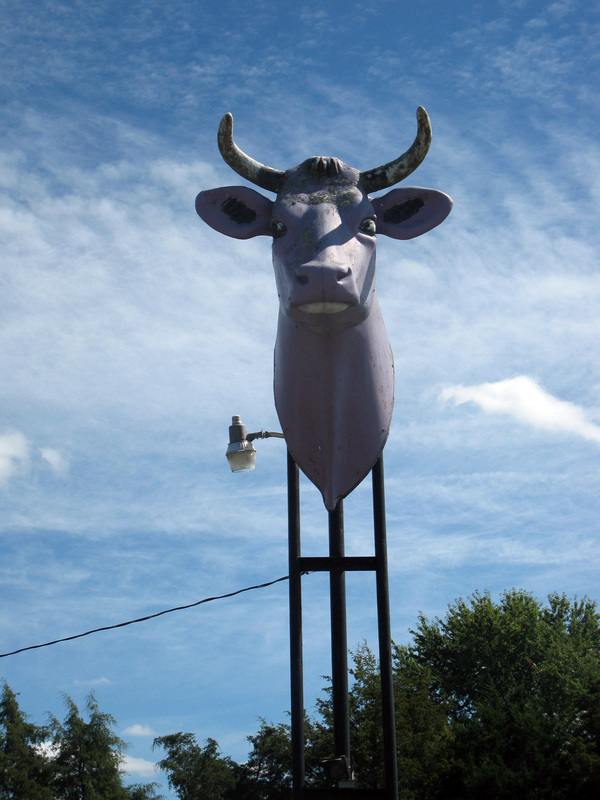 In 1964, the Simerson family ran a restaurant on the property and purchased an entire cow sculpture from a nearby dairy, colored its head purple and put it on a 20-foot pole to attract attention. A variety of businesses have been on the property since then and today it appears abandoned, but the cow head remains, and there are several homes on Purple Cow Road. Now that's an address I'd love to have. 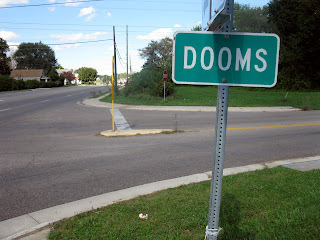 And what about the name Dooms? 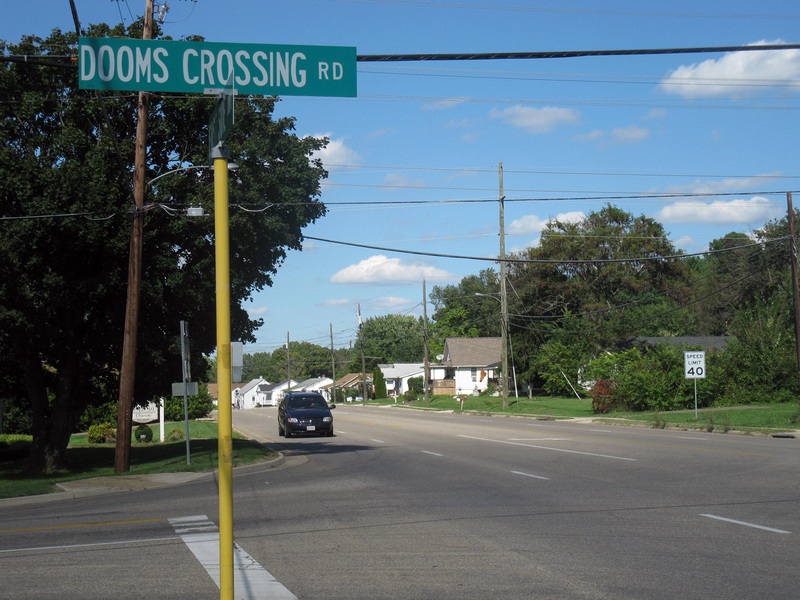 Turns out the town was started by a family with that name and there are descendants that still live there today. 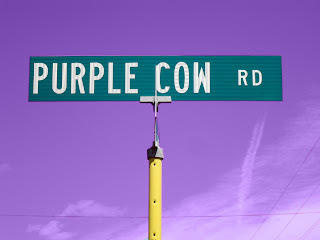 In fact, there might be one living on Purple Cow Road. So here's looking at you, cud. Power to the purple, right on. Darn ... I've been awfully close to this a few times and missed it. One more reason to head south again! Wendy: ...or perhaps a Piggly Wiggly. Bill: Ha! And then Prince showed up and we had some purple rain. "And then Prince showed up and we had some purple rain." 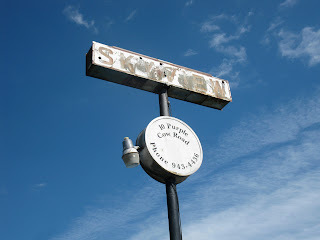 The Purple Cow made the BEST ice cream sundaes! Yes, been there, grew up in the Waynesboro area. Too bad you missed the Crimora Mines(best skinny dipping place when I was teen and before they started finding various body parts in there), the *calf* on Calf Mountain (actually no longer there)and various other curiosities of the area, lol! A relative of mine, Sarah A. Croft married George Washington Doom in 1835. He was the son of John and Sophia Doom, born in 1781, who settled here about 1800, and the area was named for them. 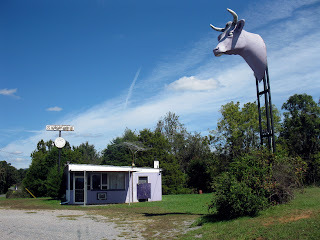 Next time you're in the area - the Purple Cow is now opened again. The ice cream and everything else is absolutely fantastic. Becky, the proprietor is the best! 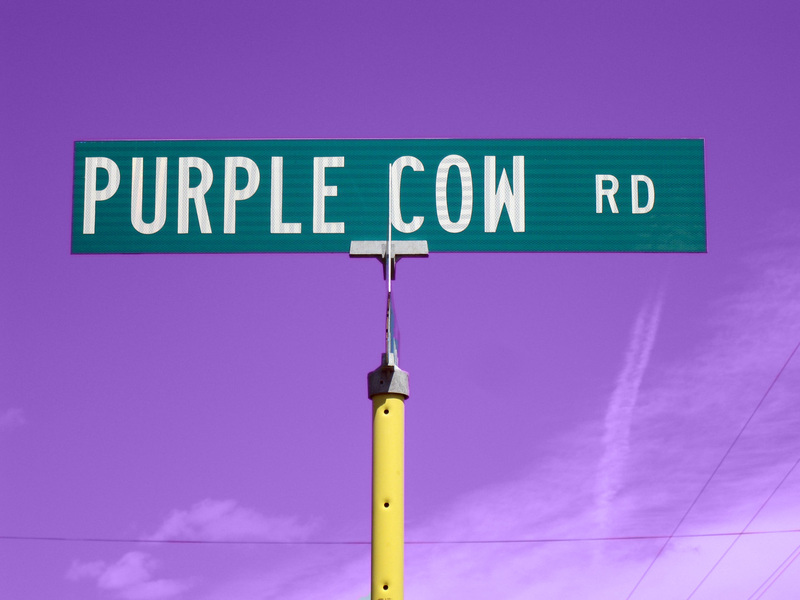 Been on Purple Cow Rd. a million times! Lived on it, grew up there. My family has lived very close by for generations. I can remember the road being gravel. 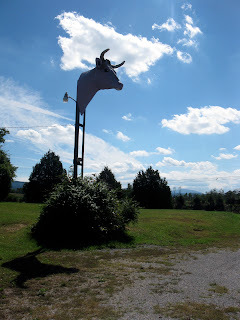 Love the Purple Cow head and have always loved it, hope it stays there forever.